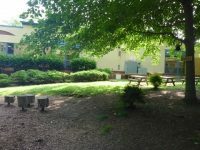 The Donald A. Quarles Outdoor Nature Classroom turned an underutilized lawn behind the school building into a vibrant and wonderful feature of our school for 460 three, four and five-year-old children. 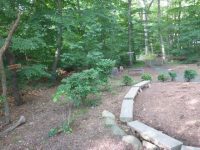 The Quarles Outdoor Nature Classroom includes a pathway through the woods with signage to help children, teacher, and parents recognize the abundance of nature that is part of our campus. 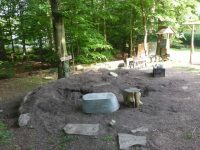 Design and construction of the Outdoor Nature Classroom was funded by the Taub Family Foundation in collaboration with the Nature Explore program and a team of teachers and administrators who saw an opportunity to develop a strong environmental education resource and a way to help children fall in love with the natural world. Science classes are often held outdoors, where children have opportunities to observe plants, animals, and weather in a natural habitat. We have two entrances to the classroom. One entry arch is by the Garden and Water Areas, the bird blind, the science materials, the decomposing log, our bulletin board and the Dirt Digging Area. The other entry arch is near the Nature Art Area and the Action Area. The Science picnic tables are near the Building Area and offer flat surfaces for block constructions. 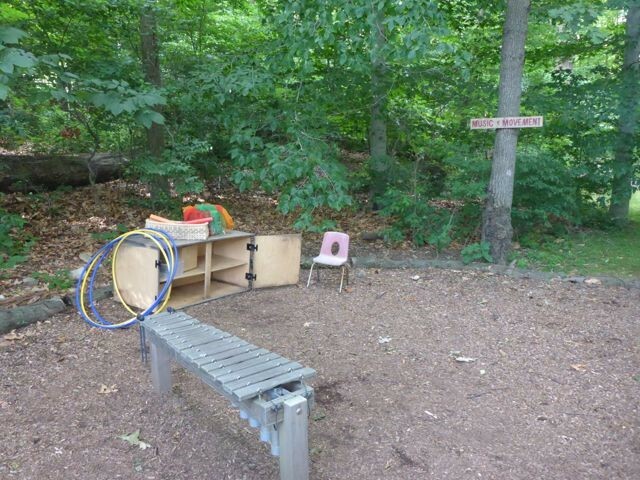 The Gathering Area is in a shady area in the center of the Outdoor Nature Classroom. 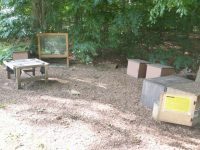 Across a path from the Gathering Area is the Loose Parts Area, whose slope in perfect for designing and testing ramps. Our tree cookies are often stacked, laid into pathways, or transported using a small wheelbarrow. The marimba is the centerpiece of the Music and Movement Area, where dancing scarves, rhythm instruments, and sound exploration materials are stored in a cabinet. Our classroom also features three bird feeders and several sets of binoculars. 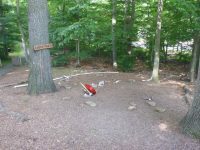 Children paint, draw, and use natural material to create in the Nature Art Area. In warm weather, the Water Exploration Center is a popular spot. We have found the Outdoor Nature Classroom to be a great resource for encouraging conversations with children who have language delays. The naturally uneven surface helps all children develop strength and balance and is particularly valued by our school’s physical therapists. Children can and should move to learn in our outdoor classroom. They can follow their own interests and frequently share theories and observations with each other. 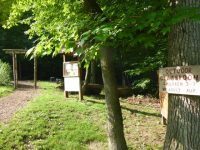 The different areas provide variety and stimulation for many different kinds of learning in a natural environment that soothes anxiety. 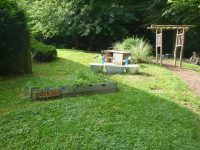 We host annual volunteer days to maintain the classroom in the fall and Family Night in the Outdoor Nature Classroom in the spring. We plan to share photos of children using the classroom at PTO meetings.